Imagine only being allowed a certain amount of meat per week… a world where sugar is precious and worth saving… where a coupon booklet is the golden ticket one needs to purchase the basics. Today, we don’t think twice about buying kitchen pantry products like butter, sugar, and meat; these products are widely available and easy to purchase at any grocery store. During World War II, however, grocery shopping wasn’t so simple. From gasoline to liquor to canned goods, nearly everything Americans bought had a point value. You were not allowed to exceed your allotted points in any given month; if you ran out of coupons, you ran out of luck. Many items simply could not be purchased without them. During World War I, voluntary rationing had been encouraged by Herbert Hoover and the U.S. Food Administration. In fact, the now popular term “Meatless Mondays” originated in Herbert Hoover’s White House (it was originally “Meatless Tuesdays”) as a way to encourage citizens to cut down their weekly meat consumption. A war rationing system was officially established in the United States after the attack on Pearl Harbor, and continued throughout World War II. Shortages were frequent and constantly changing; what was available one week might not be the next. Citizens were allowed different items based on their age and needs; babies and children were allowed canned milk, while older citizens might not be depending on availability. Food items rationed during the war included (but weren’t limited to) cheese, meat, coffee, butter, canned goods, jams, dried fruits, cooking oils, fats and shortening, and sugar. Everyday items were also rationed, including nylons, rubber and tires, coal, bicycles, toothpaste, and footwear. The list of rationed items grew with each passing month, as conflicts erupted in different parts of the world– places that would normally supply goods to the U.S. Rationing was accomplished in the spirit of patriotism, as Americans wished to help the war effort in any way they could. 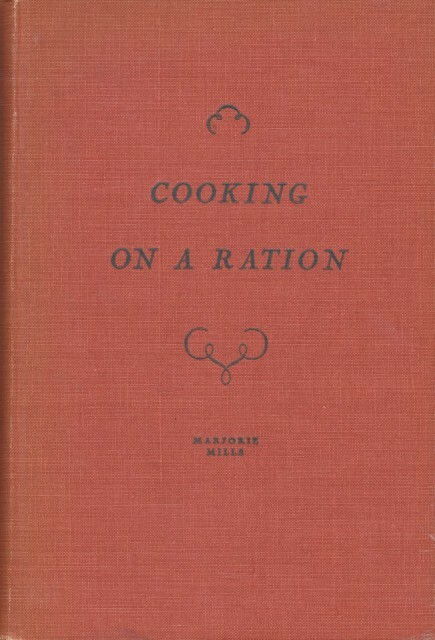 Cooking on a Ration by Marjorie Mills was published in 1943 by the Riverside Press in Cambridge, Massachusetts. It’s a classic rationing cookbook, released during World War II, to help home cooks deal with wartime food shortages. 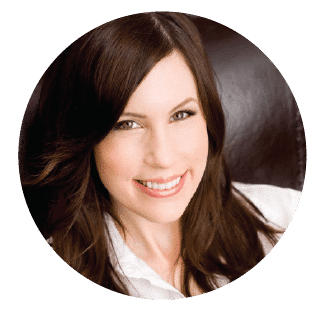 The goal of the author, as stated in the introduction, was to offer recipes and solutions for people who were only allowed a small amount of meat, sugar, and fat (oil) per week. 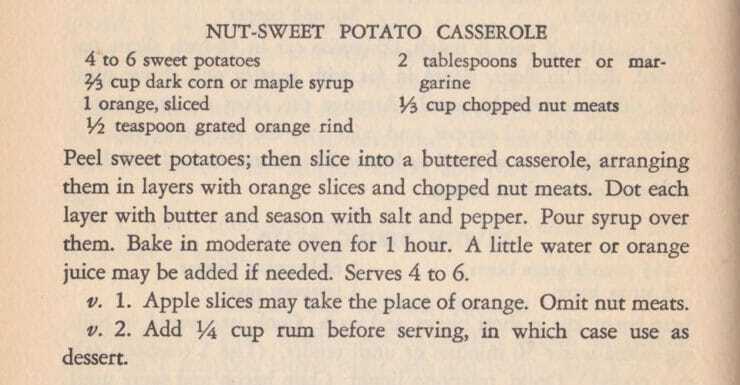 This casserole, like many historical and vintage recipes, did not turn out well when made as written. In fact, it needed quite a bit of tweaking to get it to taste good. The potatoes were undercooked and dry after 90 minutes in a 350 degree oven. The liquid collected at the bottom of the dish was thin and soupy. The oranges were limp and soggy. It was, to put it mildly, a waste of some lovely sweet potatoes. Whenever I encounter a recipe like this, I don’t like to throw in the towel. Rather, I draw inspiration from both the recipe and the time period to create something new and palatable. 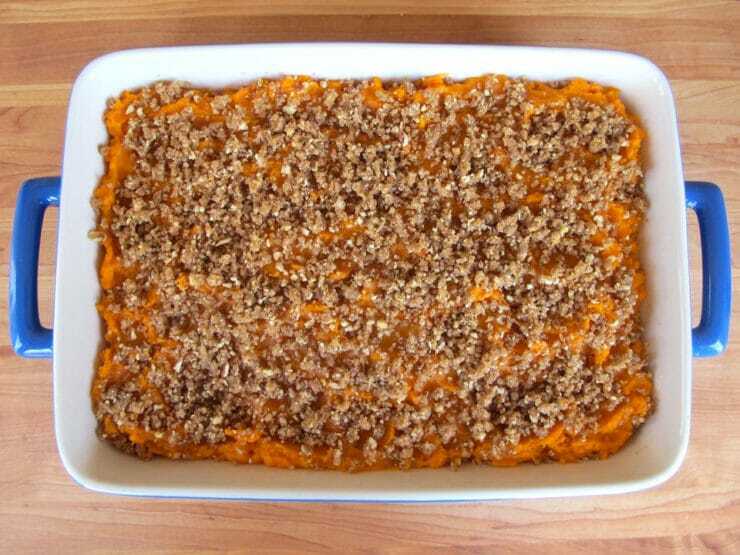 In my reinvention of this casserole, I’ve roasted and mashed the sweet potatoes to combat the undercooked texture of the original slices. 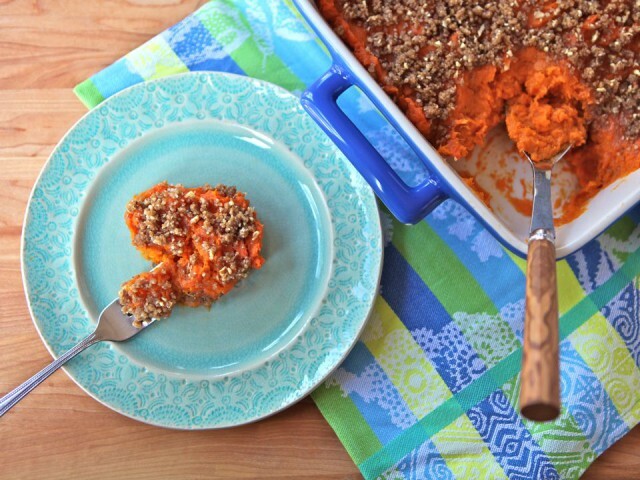 I’ve used the same basic ingredients in a new way– the orange flavor comes from fresh juice and zest, rather than slices; maple syrup is mixed into the mashed sweet potatoes to give them a warm maple essence; nuts and butter are chopped into a simple streusel topping with a little brown sugar added for sweetness. Sugar was rationed at the time, so I use it sparingly here– just 1/4 cup. Some recipes in the book call for 1/2 or even 2/3 cup of sugar, so I feel safe using a small amount in this updated version. The result is a casserole you can truly enjoy for Thanksgiving, or just because. As you serve it, consider sharing the history of war rationing with your guests. It’s such an interesting part of our American history. Learn a recipe from World War II, when war rationing prevented cooks from using normal everyday ingredients. Preheat oven to 400 degrees F. Wrap the potatoes in foil and place them on a baking sheet. Roast the potatoes in the oven for 60-90 minutes till soft. Baking time will depend on the size of the potatoes. Remove from oven, unwrap carefully, and allow to cool. Note: this step can be prepared in advance; you may keep the cooked potatoes in their skins in the refrigerator for up to 48 hours prior to assembling the casserole, in order to cut down on prep time. Reduce oven heat to 350 degrees F. Peel the potatoes, place them in a large mixing bowl, and mash them with a potato masher till smooth. Add the maple syrup, orange zest and juice, ½ tsp salt, and ¼ tsp pepper to the bowl. Use the potato masher to mix the ingredients into the potatoes, mashing and stirring till all ingredients are well combined. 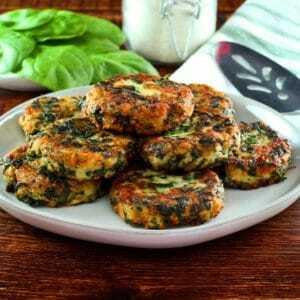 Taste mixture; add additional salt or pepper to taste, if desired. Spread the mixture into a lightly greased 9x13 baking dish. 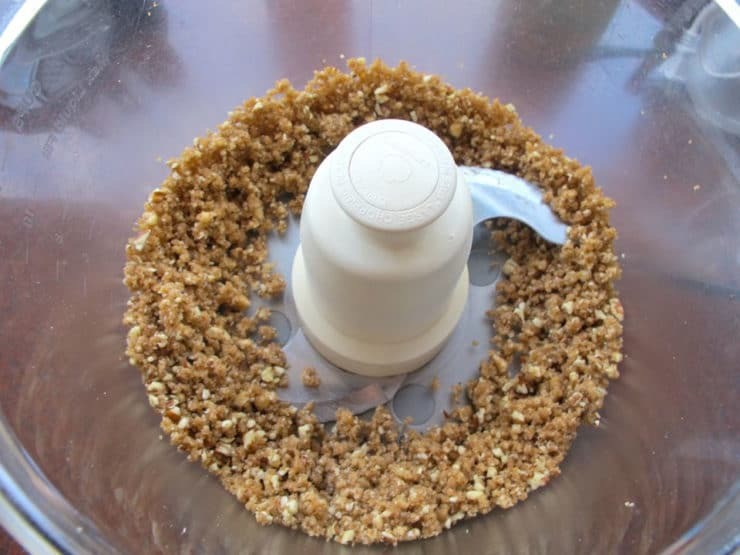 In a food processor, combine chopped nuts, brown sugar, butter, and flour. Pulse ingredients for about 60 seconds till they resemble coarse crumbles. Sprinkle the nut mixture evenly across the top of the casserole. Bake the casserole uncovered for 45-50 minutes till the top is browned and crisp. Serve warm. I will be using this for Thanksgiving! I love that you can roast these in advance. With all the other casseroles everyone wants, this will help a lot. 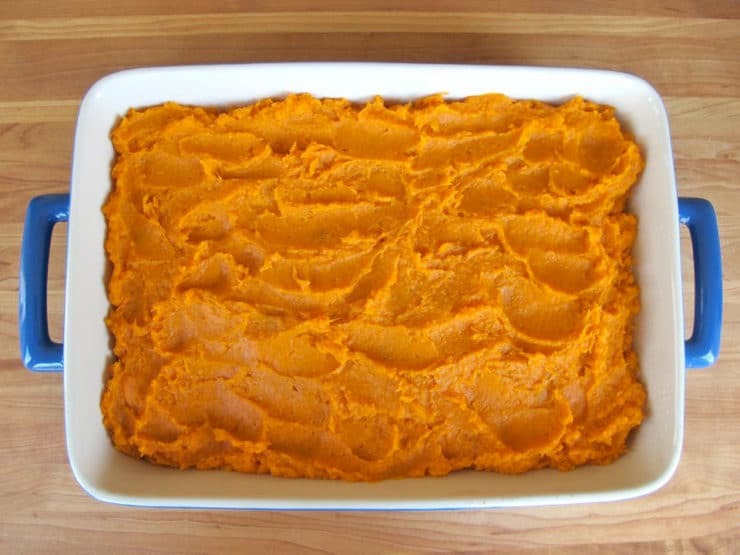 The original recipe reminds me of a Weight Watchers one my mom uses for yams for Thanksgiving. She boils the yams first, then peels and slices them into a baking dish with orange juice, pineapple chucks, cinnamon-brown sugar and butter. 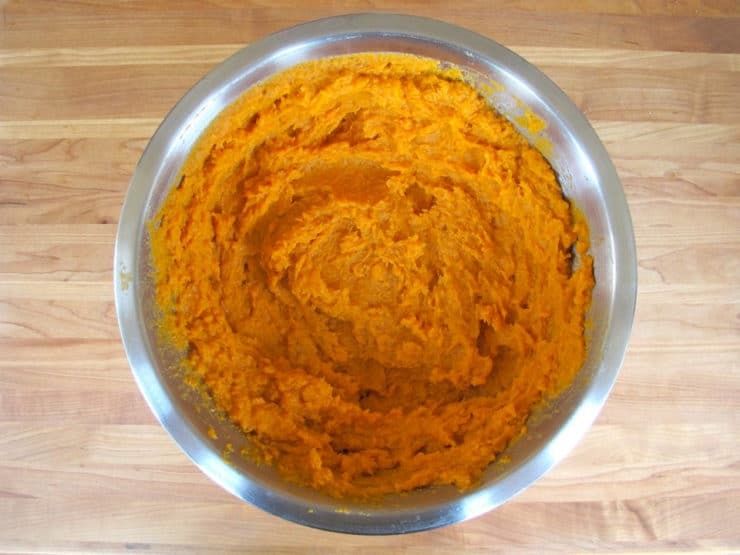 I bet you can get a better tasting dish that is closer to the original by simply par-boiling your sweet potatoes. This was a wonderful dish. Check out my online exhibit on food and the World Wars. 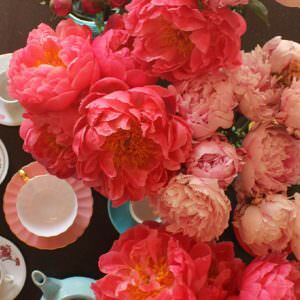 I made some other recipes from Marjorie Mills and other period sources. Tried this tonight and it was fabulous. Decided to substitute whole oats for flour, reduced the butter for health reasons, added a few extra walnuts to replace missing butter….. Thoroughly enjoyed! Thank you. Sounds delicious. Thank you Webbiest for the quick tip on roasting potatoes. You can save a lot of time (and energy!) when roasting sweet potatoes by blasting them in the microwave first for at least 5 minutes. At least the first 30 minutes of roasting just goes into getting the potatoes warm; no browning is going on yet. 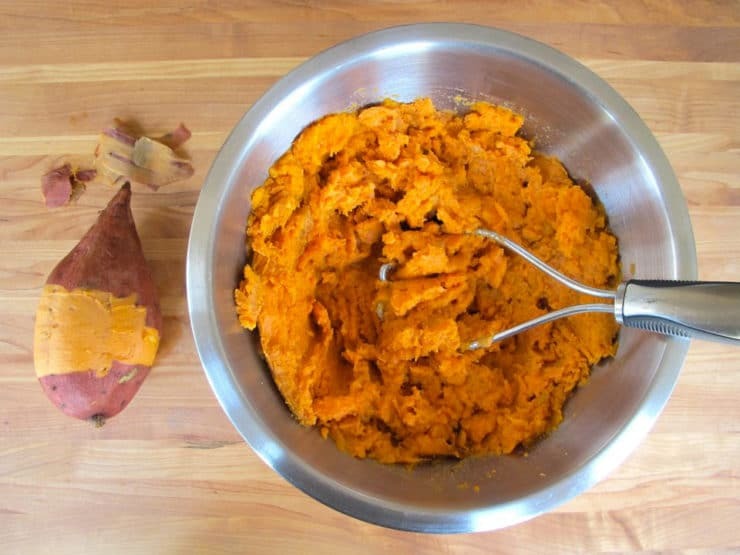 once you get the sweet potatoes nice and hot, roast them until they are as soft as you want to get them. I have that cookbook, too! Great to see a recipe from it published here.